Hey all! Carmen here =) Long time no update! How is everyone doing? I’m assuming all University students are finishing up their last few days of class, and getting ready to dive into a mountain of exams. I feel for you all. Anyways, since we haven’t had the time to do an ootd, or any creative projects, I have a hair product to recommend for you guys (especially if any of you have dry, or damaged, or thin hair)! I’ve been looking for a solution for my super frizzy and damaged hair for years. I used moisturizing shampoos, loads of conditioner, and tried different types of hair oil but still couldn’t find a way to “cure” my hair. Well, guess what? There’s actually no such thing as a “cure” to damaged hair. Once it’s damaged, its damaged. The only way to “cure” your hair is to actually use products that mask the appearance or conceal the damage. 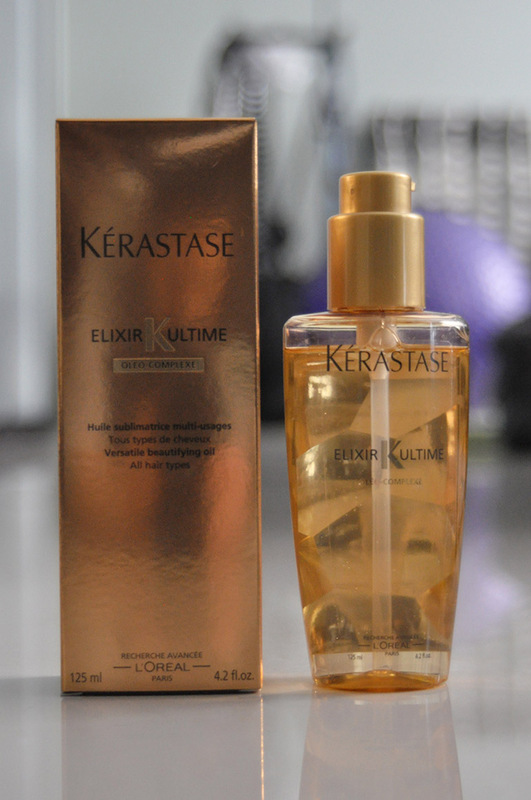 I haven’t been able to find such a product until I went to my hair dresser a few weeks ago and she recommended me the Keratase Elixer Ultime by Loreal. I honestly thought she was just trying to make a sale, with all that good talk about the hair oil. Nonetheless, I needed a hair oil anyways and decided to go with the product. I’ve been using it for the past few weeks, and my oh my goodness. I think im gonna stick with this stuff for life. It works like magic!!!! The product doesn’t’ make my hair oily, and it makes it super soft and shiny! The oil not only coats and protects your hair; it actually moisturizes it as well! So everytime after I wash my hair, I put 1-2 pumps of this product into my hair and blow dry. My hair is left frizz-free, glossy, lightweight, and instantly livelier. For those of you who share the same hair issues with me…just try this product! I can almost guarantee you’ll love it. Unfortunately, the only downside is the price. It retails for $54 in Canada, for 125mL. Nonetheless, definitely worth a try! Goodluck on all exams, everyone! We promise we will update more in the upcoming months.